Take a relaxing stroll in the Jade Butterfly garden, soaking up the glorious sunshine and feeling the light breeze on your skin. You'll see hundreds of colourful little butterflies fly past as you walk through the grass filled with beautiful bright flowers. 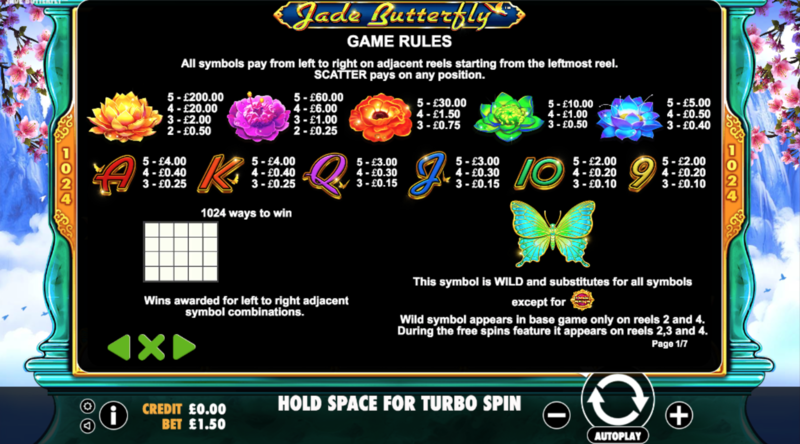 Jade Butterfly is a 5 reel, 1, 024 ways to win slot created by Pragmatic Play. 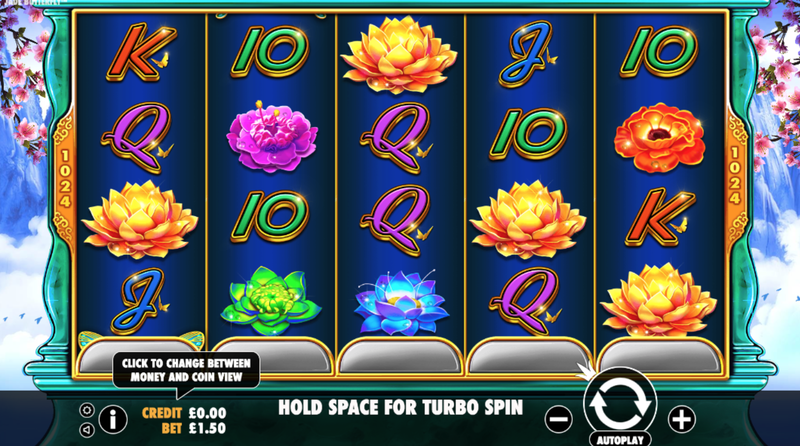 This online slot has an Asian garden theme with a beautifully bright design. You'll see flowers, butterflies, and pretty pink blossom trees. As you make your way through the garden, you'll hear a calming oriental soundtrack. 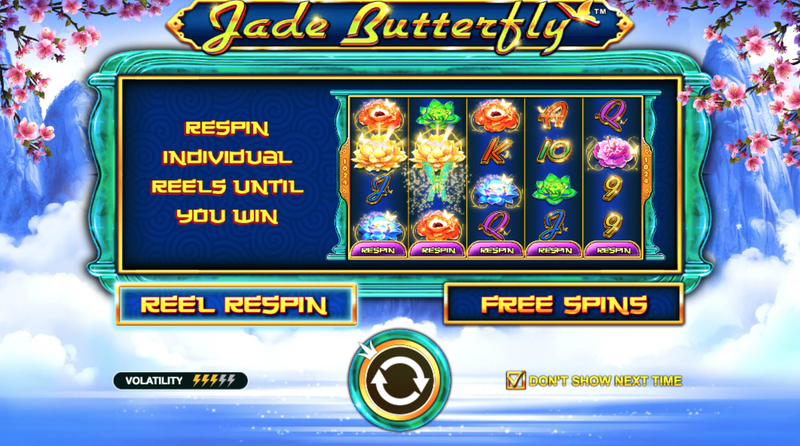 Jade Butterfly has some great features including an individual reel respin feature and free spins feature. Play Jade Butterfly at https://www.easyslots.com. Jade Butterfly is a 5 reel, 1, 024 ways to win slot with a classic oriental theme. You'll walk through the beautiful Japenese garden feeling full of calm and tranquillity. Jade Butterfly garden is the perfect place to go when you want to de-stress. Behind the reels, you'll see a view of the Asian garden. There are pretty pink blossom trees all around and a calming blue waterfall. Symbols include shiny playing card suits A, 10, J, K, and Q as well as pink, green, orange, and blue lotus flowers, and a large green butterfly. The Wild Symbol - The wild symbol is the stunning butterfly and this substitutes all other symbols on the reel bar the scatter. The wild can only land on reels 2 and 4. Individual Reel Respin Feature - After every spin, you will have the opportunity to spin one of the reels again to reveal a new winning combination. Free Spins Feature - Landing 3 free spin scatters will unlock the free spins feature. Landing 3 free spin scatters will award you 2x your stake, landing 3 will award you 10x your stake, and landing 5 will award you 5x your stake. Once the feature has unlocked, you'll also be given 13 free spins. All wins during the free spins feature will benefit from a 3x multiplier which will treble your total stake. The wilds have the ability to land on more reels during this feature to create even more great wins. Pragmatic Play is a leading provider of online games delivering top-quality entertainment across the globe and here at Easy Slot. They have a range of products to suit gamers of all kinds including scratchcards, bingo, live casino, and slots. Pragmatic Play creates some of the most unique slots on the market. Jade Butterfly takes you to a magical place filled with peace and tranquillity. The design is stunning with gorgeous butterflies, colourful flowers, and pretty blossom trees. The oriental theme is beautifully done in terms of design and audio. The individual respin feature is an exciting one as you have the chance to spin reels again to make more winning combinations. Find out more at https://www.easyslots.com.